Imprisonment is the most effective form of intimidation and harassment used against journalists. In Ethiopia--number four on CPJ's most censored list--the threat of imprisonment has contributed to a steep increase in the number of journalist exiles. Amid a broad crackdown on bloggers and independent publications in 2014, more than 30 journalists were forced to flee, CPJ research shows. 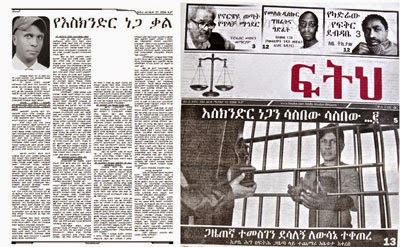 Ethiopia's 2009 anti-terrorism law, which criminalizes any reporting that authorities deem to "encourage" or "provide moral support" to banned groups, has been levied against many of the 17 journalists in jail there. How censorship works: As Ethiopia prepared for its May 2015 elections, the state systematically cracked down on the country's remaining independent publications through the arrests of journalists and intimidation of printing and distribution companies. Filing lawsuits against editors and forcing publishers to cease production have left only a handful of independent publications in a country of more than 90 million people. Ten independent journalists and bloggers were imprisoned in 2014; authorities filed a lawsuit in August accusing six publications of "encouraging terrorism," forcing at least 16 journalists to flee into exile. There are no independent broadcasters, though broadcasts from the U.S.-based opposition Ethiopian Satellite Television (ESAT) intermittently air within the country. The state-controlled telecommunications company Ethio Telecom is the sole Internet provider and routinely suspends critical news websites. International journalists work in Ethiopia, but many are under surveillance and face harassment. Although journalists have not had difficulties acquiring accreditation in the past, newer arrivals say that they face challenges. Lowlight: Authorities in 2014 unleashed the largest onslaught against the press since a crackdown in 2005 after disputed parliamentary elections. Ten independent journalists and bloggers were arrested on anti-state charges, and at least eight independent publications were shut down.